Want to know the day when the press lost it’s power? In their weekly Sunday morning news shows, ABC, CBS, and NBC put the power of the press on full display on November 6, 2016, two days before the election. At long last, they would elect Hillary president, nearly a quarter of a century after she first ran as co-president. A two-fer. Vote for him, get him and her. And 24 years later, the polls showed her ahead. While Nate Silver hedged his bet, he still put her chances at 2-5. CHRIS MATTHEWS: “It’s all professional, it’s all legal. You basically pay people to go out door-to-door starting at 11 in the morning, you roust ’em out of the house. If they haven’t voted, you say, “Why haven’t you voted?” You go back at 4:30 in the afternoon, roust ’em again. You make sure that in these congested all Democratic districts, where everybody is a Democrat, they all vote. JOHN HEILEMANN, BLOOMBERG POLITICS: “We get those results earlier. Places like Nevada, I think now, given the early vote, is probably gone for Donald Trump already. But African-Americans in North Carolina, suburban, Philadelphia suburbs turnout, like just raw numbers in Philadelphia, whether Clinton can run up the — the — the totals there, that will kind of lock down Pennsylvania if she does. And we look at those compared to 2012. Those are the earliest things. They threw caution to the wind, and with it, their credibility, which is the source of their power. Was the source of their power. The next week there were excuses. There were recriminations. There were sad, sad faces. But my favorite was this exchange on “Face the Nation” on November 13. I know Parma. Southwest suburb of Cleveland. Named its high schools Parma, Normandy and Valley Forge. Pretty ethnic. Pretty patriotic. You know, maybe if the networks had listened to the people instead of the polls, then the networks might not have been so surprised. The media lost on November 8, 2016. Bigger than Clinton. She can tell herself, hey, I was the first one to try to be the first woman president and I will be revered when we finally elect one. But what does the media get? Egg on the faces of all those experts. By the way, no one lost their job. It’s as if the network bosses want ignorant people giving their opinions on Sunday morning. 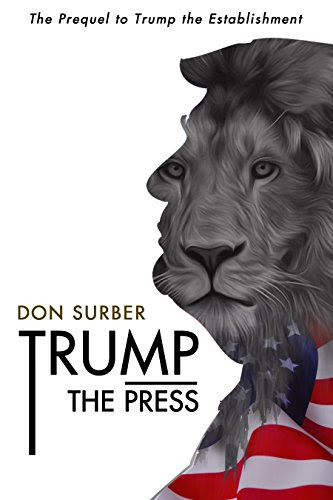 Don Surber is a renowned retired newspaperman and columnist of forty years experience living in Poca, West Virginia. In July, he published Trump the Press on Amazon, a look at how the experts got the Republican nomination wrong. It is available on Kindle, and in paperback. His bestselling new book, Trump The Establishment is a stirring sequel covering the election. It is also available on Kindle, and in paperback. Caution: Readers occasionally may laugh out loud at the media as they read these books. I know I did! Lots. And friend him on Facebook. WoW! Forum: How Would You Rate Trump’s Performance After Six Months? Fake News of the Week! February 20, 2017 JoshuaPundit Politics Comments Off on Fake News of the Week!